I've closed 4 positions total over the last week or so and there's another 2 that I'm very seriously contemplating closing but need to decide before the end of the year. I'll cover the first 2 positions today so without further ado. I originally purchased 23 shares of Cummins (CMI) back in October 2012. That seems like forever ago. I reinvested the first 3 dividend payments back into more shares and then started taking dividends in cash. All in all I was able to turn an investment of $2,020.22 into $3,055.50 plus $471.48 in cash dividend payments. So there's no complaints from me. That works out to a 75% total return in just over 6 years or ~10.0% internal rate of return. My sale of Cummins was primarily one based on just not having a big enough exposure to the company and partially souring on the company. I've included a few metrics about Cummins in the following table. As you can see revenue has grown solidly from the end of 2011, the last completed fiscal year before I purchased shares, through both 2017 and the TTM period with growth of 13% and 28%, respectively. However, margins have been compressing significantly or management is just have a bad run at the operational level. This can be seen in the 46% decline in net income, only 10% growth in operating cash flow and 21% growth in free cash flow through the end of 2017. The numbers come to -30%, 6% and 10%, respectively, through the end of the TTM period. 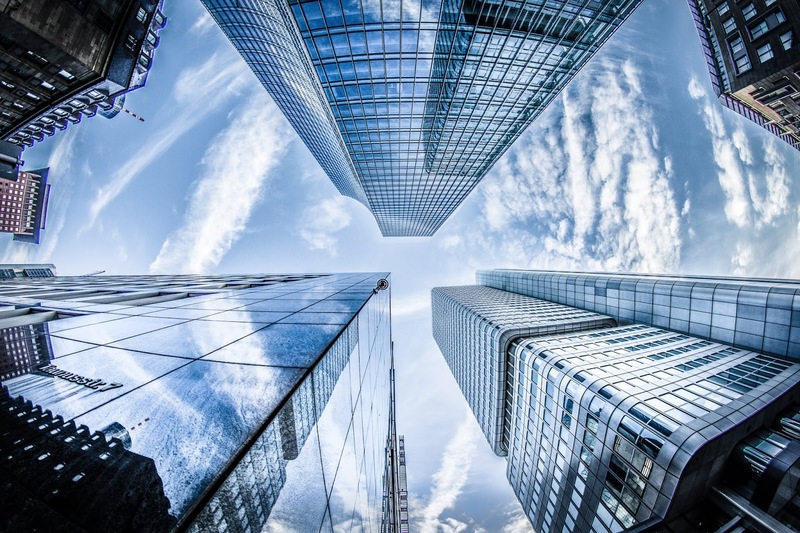 In that same time the dividend has continued to grow, on both a total dollar and per share basis, and has far outpaced the growth of any of the relevant metrics. That's led the free cash flow payout ratio to climb from ~22% in 2011 to 41% in 2017 and 47% for the TTM period. It's still plenty safe at these levels; however, further growth is likely going to be constrained to earnings/free cash flow growth. Dividend growth was solid over the time that I owned Cummins; however, the last 3 increases have all come in right around 5%. That's still not bad considering that shares are yielding ~3.5% given the small stake that I had I figured it was time to take my money and run by building up my cash. By closing my position in Cummins my FI Portfolio's forward 12-month dividends decreased by $106.33. I originally purchased 20 shares of T. Rowe Price in March 2015. I took the first 3 quarterly payments and the $2 special dividend payment in cash and then reinvested the dividends since. My $1,658.95 investment in T. Rowe Price turned into $1,999.46 in just under 4 years. Not bad but definitely not what I expected from it. I also received $86.43 in cash dividend payments along the way. That works out to a 21% total return or a 5.24% internal rate of return. My sale of T. Rowe Price was primarily borne out of needing to trim the number of positions that I own and T. Rowe was some low hanging fruit with very little capital invested there. T. Rowe the business has been doing just fine. Fiscal year 2014 had ended a few months prior to my initiating a position in T. Rowe. From 2014 through the end of 2017 and the end of the TTM period T. Rowe has done just fine. Revenue has grown 20% and 33%, respectively, while net income is up 22% and 49%, respectively. Likewise total cash dividends are up 22% and 44% for the same periods while per share dividends were up 30% and 52%. Even with the rapid dividend growth the payout ratio has held steady at 38% for 2014, 38% for 2017 and 36% for the TTM. 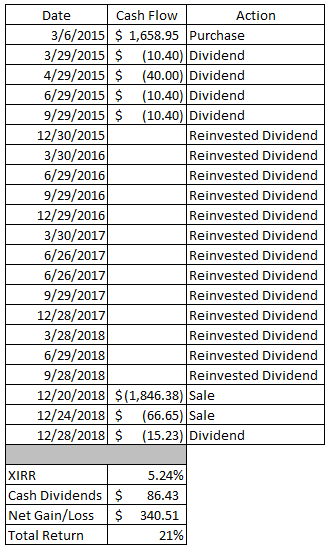 T. Rowe's dividend growth has been all over the place with dividend growth ranging from 4% to 23% for the ~4 years that I've owned the company. I can't help but think that I might have made a rash decision here to sell and getting caught up in the market turmoil. I wouldn't be opposed to re-adding T. Rowe to my portfolio in the future because I think the business/industry is still a solid one to be in. T. Rowe has likely seen some pressure on their business as the "passive investing/indexing" revolution took hold. Given the bull run since 2009 it should come as no surprise that indexing has performed well. However, now that we're seeing a return of volatility and the horrendous December thus far I wouldn't be surprised to see some people swap to more active management meaning a potential boost in AUM as people transfer funds there. Closing my position in T. Rowe Price reduced my FI Portfolio's forward 12-month dividends by $60.92. These 2 positions provided $167.25 in annual dividends so they will surely be missed. However, I've now added to my cash buffer $4,983.76 which will help to give me some dry powder to work with should the markets continue to move lower. Given the overall valuation levels of the market in general I see that as a very real possibility and the odds just move higher should a recession ever rear its head. In addition to these 2 positions I've already closed out another 2 that I'll cover likely on Monday and have at least 2 more that I'm considering closing and will need to decide on before the end of trading on Monday. Have you been tax loss harvesting? Did the bull market of the last 10 years let any positions creep into your portfolio that probably shouldn't have? Let me know in the comments below. Hey JC, great to see you cleaning up your portfolio with some well considered sale decisions. It can be one of the hardest things to do to sell, but you have some really clear rationale for your decisions - great work. My Fund is relatively small at the moment with 10 individual stocks, and I like to keep things a little more concentrated, so wouldn't be planning to hold more than 15 or so on average . No unwanted positions as yet - the focus is still on adding quality businesses at good value prices. Best of luck deploying some of those funds in 2019! I had been meaning to do this for a while, but the bull market just kept raging on so I just kept pushing the process off. I'd much rather be anywhere between 25-40 holdings so there's still a lot more trimming that can be done. I now have over $13.5k of cash on the sidelines and will be looking for some opportunities to put it to work. Some of the companies I'm looking at now are BDX, V, COST, PEP, IRM, MO, SJM, BLK. Only 1, BLK would be a new position for me although with a few more positions potentially on the chopping block there's room for me to add 1 without hurting the overall plan. Yeah unfortunately I got caught up in the GE fiasco and should have sold much earlier. GE is still on the chopping block but I'm almost hesitant to sell now after it's huge decline. I might sell about 40% of my remaining position on Monday to get the tax loss harvest and then see what happens with the remainder. You know, this is something I think doing all the time. I have may positions that are less than $2,000. I've built some of those recently with mall purchases, but I'm now facing a decision of continuing to build those positions, selling, or receiving small dividends. I completely understand why you would decide to sell. CMI has been a roller coaster. I've looked into investing in the company over the years and I"m happy I went elsewhere instead. Think of it this way too. Sure you lost some income. However, you could put those funds in a high-yielding savings account (Ally is at 2%). CMI is yielding 3.4% and TROW is yielding 3.0%. Sure, you're losing some income, but that's only 1.4% and 1.0% respectively if you use a high yielding account. Just a thought. Tax loss harvesting wouldn't have been a bad idea this year. It is something I should probably pay more attention to in future years. Looking forward to swinging over to Part 2 now! I think it depends on how much time you have to devote to following companies or how much you think you actually need to. Some companies I don't think require much more than a cursory glance each year something like CL or PEP, but others require more attention. Ideally I'd like to get down to say 30-40 companies so that still means there's 10-20 potential cuts from my portfolio. In reality though I'm probably going to increase my positions because there's still plenty of companies that I want to own. I'd just prefer to get positions built up larger. The first few years of my investing I was more about building out the holdings as opposed to building up the holdings. However, I think that really needs to shift back the other way now to be getting meaningful positions/dividends out of my investments.